Monday was the start of the Pro Manager Mastercourse Vegetables, organized by Jungle Talks. Horticultural managers from around the globe participate in a two-week mastercourse in the Netherlands, with a focus on (greenhouse) vegetables. The Pro Manager Mastercourse welcomes 15 inspiring horticultural managers between 25 and 40 years old, who will soon play a leading role in the future development of vegetable production in their country/region in an innovative and sustainable way. Each participant has a minimum of 5 years working experience in a leading position within their company. In these weeks, the participants are focusing on current problems in today’s horticulture. 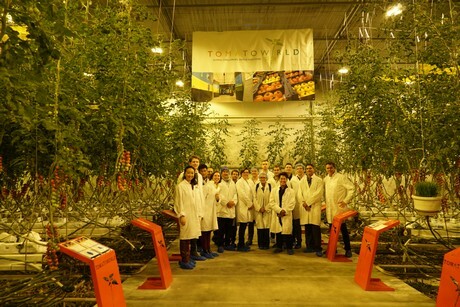 They will visit, amongst other companies, Duijvestijn Tomaten, Wageningen University, and Bom Group. They will exchange knowledge and experiences with peers and captains of industry in the Netherlands. All participants will work on the future strategy of their company in a global context. These visions will be presented on the final day of the mastercourse at the Fruit Logistica, the fresh produce trade show in Berlin. 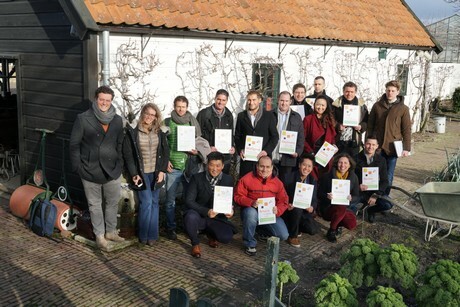 Also Ridder is a partner of the Pro Manager Mastercourse; a two-week program that provides young horticulture entrepreneurs with the opportunity to discuss the future of their greenhouse business with the captains of the Dutch horticulture industry. During their visit at Ridder, Chief Innovation Officer Joep van den Bosch kickstarted an inspiring session program in line with the ‘Helping You Grow Your’ brand promise of Ridder. The group discussed the necessity to adapt technology and knowledge to local markets. As well as this, the impact of important future developments in the field of data analysis, AI, machine learning and the autonomous greenhouse provided inspiring food for thought. The day was concluded with a field-visit to the innovation center of Ridder ambassador Duijvestijn Tomaten, one of the most sustainable and forward-thinking greenhouse growers in the world. Award-winning grower Ted Duijvestijn provided the group with inspiring insights on energy efficient greenhouse production and produce marketing. On Tuesday Koppert Biological Systems hosted the second day of the two-week Pro Manager Mastercourse Vegetables. The company shared its vision on resilient cropping with horticultural managers from around the globe. 15 talented horticultural manager between 25 and 40 years old were selected for this special Mastercourse. For two weeks, the participants will focus on current problems in today’s horticulture. They will exchange knowledge and experiences with peers and captains of industry in the Netherlands. All participants will work on the future strategy of their company in a global context. These visions will be presented on the final day of the Pro Manager Mastercourse at the Fruit Logistica, the fresh produce trade show in Berlin.